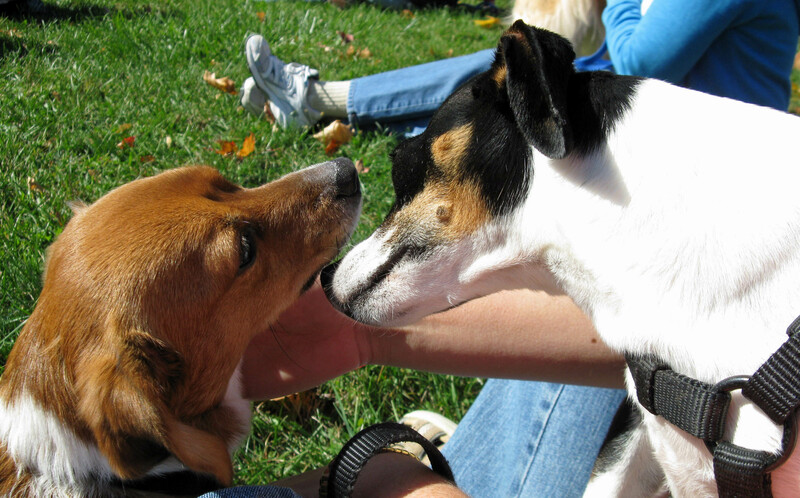 Scraps and Rags love each other at the dog park walk. The bee was accepting donations. 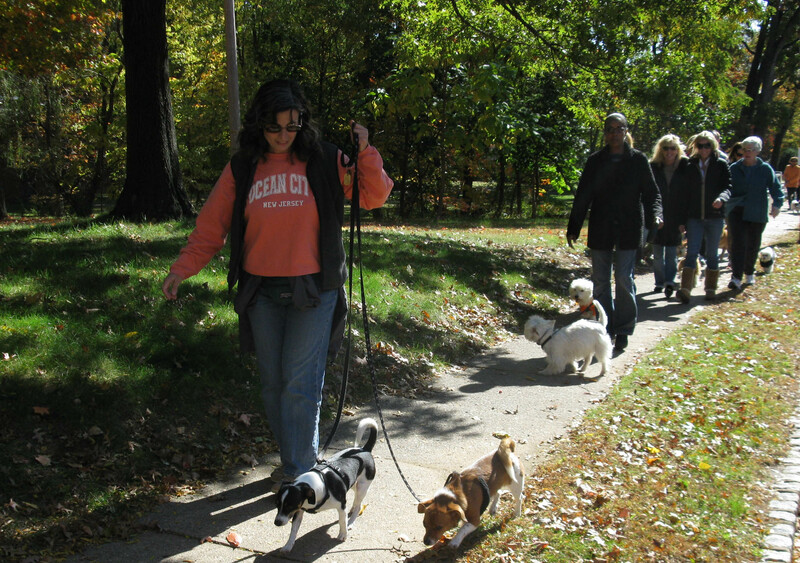 On Sunday, October 19, 2007 Scraps and Rags, as well as Kathy and I, joined about 50 other people and dogs in a walk to support and find out information about Morris County’s newly proposed dog park. The Park Started at the Lutheran Trinity Church, just north of Franklin Street in Morris Plains. 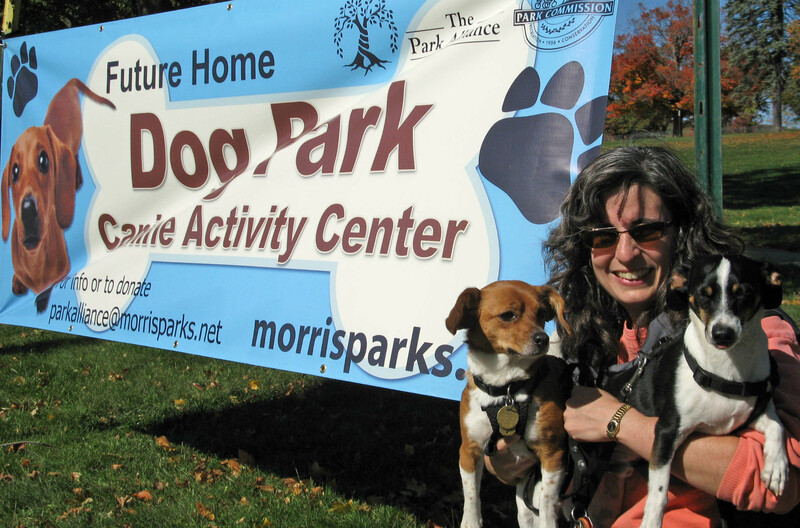 The plan was to meet at the church and walk about 0.7 miles through bucolic Morris Plains to the location of the new dog park in the new Morris County Central Park. This is the park that is being established at the new property Morris county obtained from the closed Greystone Psychiatric Campus. It is pretty exciting and that is why Kathy and I want to support it. Scraps and Rags walking to the new dog park. It was a beautiful autumn morning in Morris Plains. The trees were about a week past prime but due to the recent gorgeous weather, most of the colorful leaves were on the trees and not on the ground; and we do know that in Morris Plains the leaves inevitably fall to the ground. In parts of western Morris County some are trying to stop this inevitability. 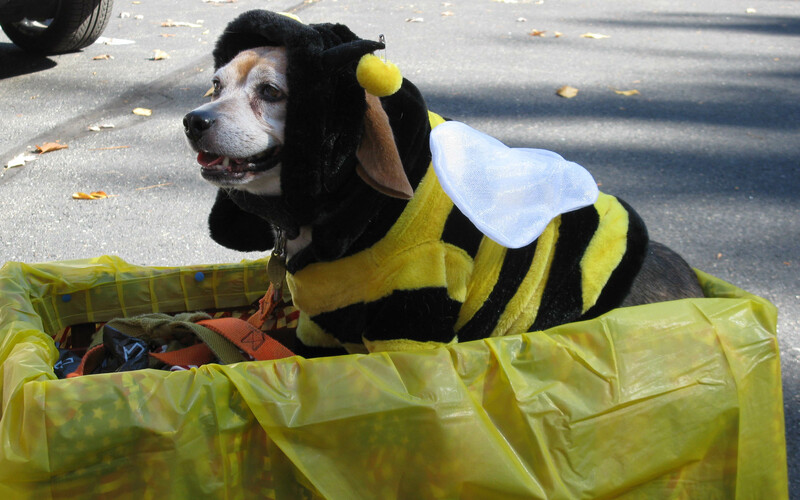 The dog park will be the responsibility and owned by the Morris County Park Commission but they still have to get the park raised up on their budgetary hierarchy so it is still some time away from opening but they have a site which is 90% of the battle. Dignitaries at the walk who I would like to thank for supporting the effort included Morris Plains, Mayor Frank Druetzler, Morris County Sheriff Ed Rochford, Morris County Freeholder John Murphy. Also there from the Morris County Family were Dave Helmer and Denise Lanza of the Park Commission and and the Park Commission’s chairman Judy Schliecher. Then let us not forget Morris County’s Recycling and Solid Waste Coordinators Kathleen Hourihan and your humble narrator Larry Gindoff. There were probably some others that I am forgetting but let us not forget the real stars of the show. The dogs and the beautiful setting for the park. Build it and they will come. Come Rags. Come Scraps. 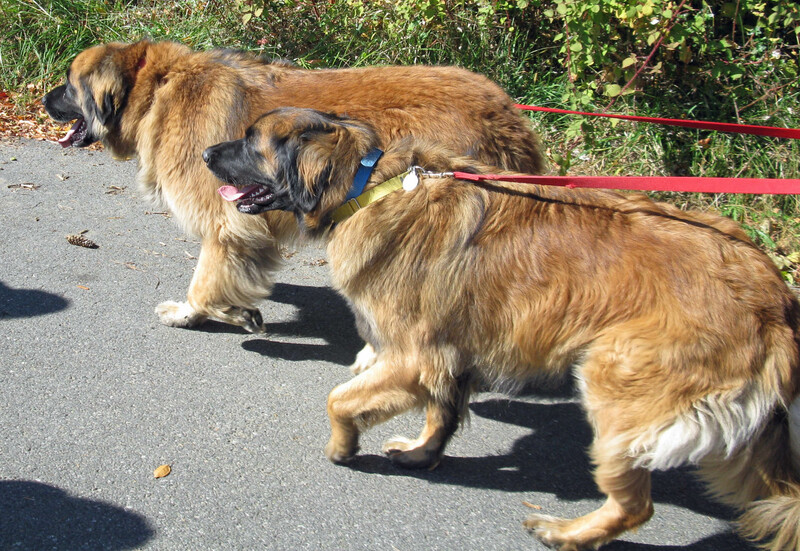 The walk started at the church and there must have been 40 dogs in all. Usually I would be embarrassed by Rags in that situation but Rags was on her best behavior and so were most of the dogs. I was impressed. It wasn’t until we sat down to listen to the speakers that Rags misbehaved when a dog or two came over to sniff where we were sitting. And even then, it wasn’t all that bad. I think it really helped that we walked at a fast pace from home to the dog walk and that probably tired out Rags a bit. I was even able to let Frank Druetzler walk Rags for a while and she handled that great. Scraps was on his usual best behavior. 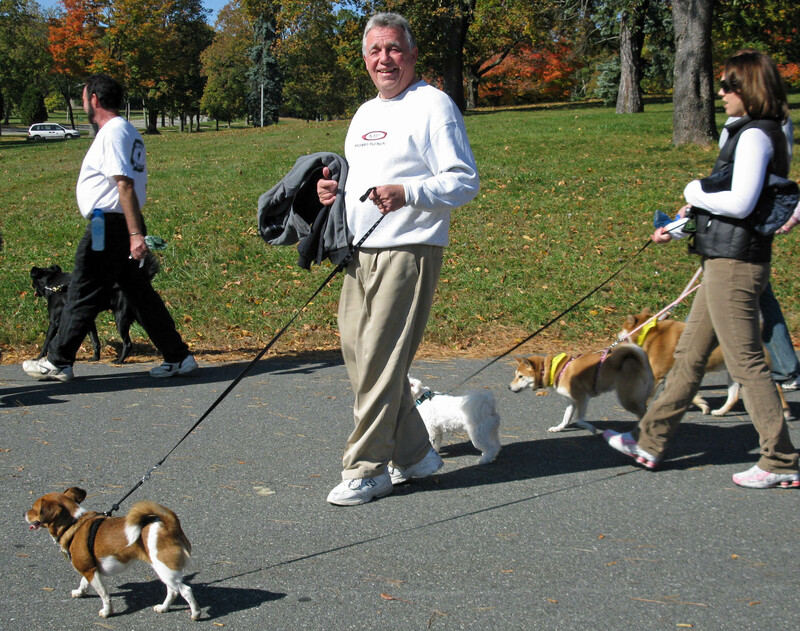 Morris Plains Mayor Frank Druetzler walks Rags during the walk. In the end kathy and I both donated money to the Morris County Park Alliance which is a non-porofit established to funnel money to the Morris County park system from some donners that cannot donate money directly to a governmental orginazation. 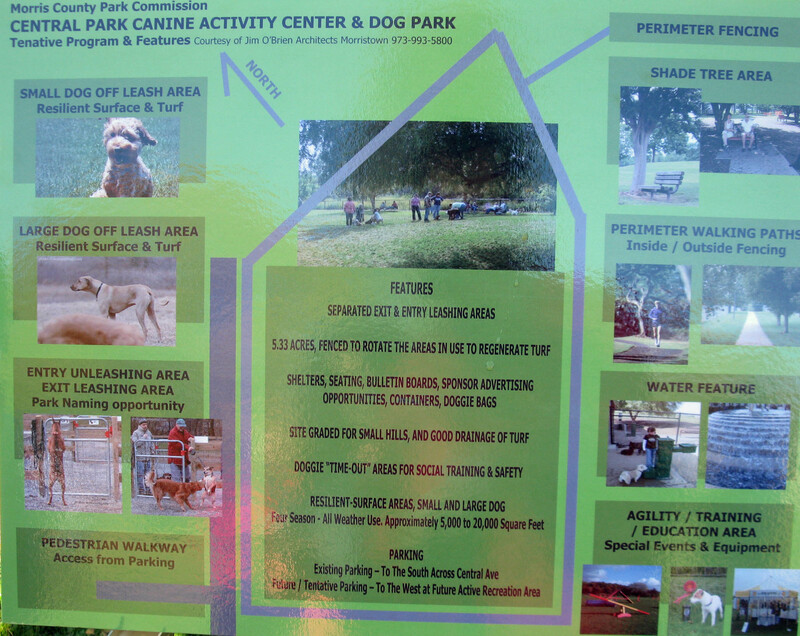 It seems that the Park Commisson needs to generate some donated money to help fund the dog park and that will give them the ability to push it over the edge. Hey whatever it takes, thanks to all who are involved. This was displayed at the dog walk.